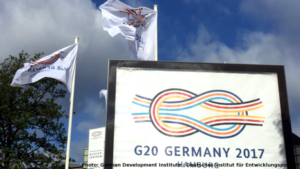 G20 Africa cooperation: a German push or a true G20 initiative? Africa was supposed to have a special attention at this Summit. Already during the preparatory stages of the gathering, various plans for the continent drafted without Africans involvement were being scrutinized by the media and civil society. At a special Berlin G20 Africa Partnership Conference, barely three weeks before the Hamburg Summit, one could sense confusion between the announced Marshall Plan (rebaptized by some African Presidents as Merkel Plan) and a “G20 Compact” prepared by International Financial Institutions under German sponsorship. Both documents recycle the usual catalogue of good intentions towards Africa, but this time around focusing on the need to consider opportunities and mobilize investments from more reluctant players, such as institutional funds. The impression in the air was of a German push and a German Conference with selected African leaders, rather than a true G20 event and initiative. As expected African leaders welcomed the attention and praised Germany for the “new partnerships”. The annex devoted to Africa approved by the Summit Sherpas is a shopping list of every other document and initiative launched by international fora in the last few years. Nobody can be against it. In concrete terms though, what results from all this effort are the announcements by Germany of funding totaling less than $ 500 million, probably from recycling part or the totality of its ODA to the continent; or approximately half the cost of the Elbphilharmonie’s project. This so called “signature programs” are, make no mistake, for the whole of Africa. They are supposed to sparkle synergies and leveraging – new favorite buzzwords – that will generate billions, it is said. The inside track of the discussions was dominated by tensions about how to link or delink Africa and the sensitive migration issues. Fortunately, at the end the delinking line prevailed. After all, migration is not Africa-specific. Prominence was given to the food insecurity, humanitarian crisis and pandemics threats pervasive in the continent. Some members of the G20 have built a much more robust relationship with the continent over the last decade and half. For instance, China, India or Turkey can claim a significant increase of their level of engagement through trade and investment. But their voices were not strident in Hamburg. They continue to prefer their own individual approaches to Africa, while paying lip service on this matter at the G20. Was the G20 Hamburg Summit therefore useless for Africa? Not at all. The importance and centrality of the climate change discussion announced a new era for this group. Created to deal with the global financial debacle of 2008-9, in recognition of the limitations of the G7, it has evolved into some sort of global governance central directory. The admission that climate discussions directly relate to the financial and economic dimensions of globalization is something Africans should welcome. They already suffer more than most from rising temperatures and adaptation deficits. Africans should remind the world about the price of climate injustice and big polluters responsibilities. But time has come for the continent to position itself as part of the solution rather than part of the problems to address. Africa should no longer accept to be treated as a passive receiver of the adaptation funding hand-outs promised several times over and never materialized. Leapfrogging technological opportunities can help Africa industrialize to the benefit of its vast and growing consumer markets, tapping into segments of the value chains that are still available to it, such as agro-processing and low-value end manufacturing, looking for delocalization. A minor increase in value-addition of currently exported commodities would also generate sizeable number of decent jobs. Such an industrialization drive requires infrastructure, education, competencies as well as better policies and expanded markets. Regional integration through the establishment of a continental free-trade area is a must. These challenges can be unique opportunities to invest in Africa’s vast green economy potential. Possessing one the largest reservoirs of renewable energy, arable land and mineral wealth, African can do it right, without the need to retrofit. How the G20 considers climate change and trade matters. How conditions are created to stimulate investment and increase risk appetite matters too. They offer windows African leaders are pressed to unlock. It requires flexibility by the international financial institutions, stopping the one-size-fits-all treatment of macroeconomic policies, such as the ones that deal with debt sustainability or business environment attractiveness and promotion, or improving risk management and regulation. Instead of being too distracted by others‘ plans for Africa, it is high time to have a plan for how the continent deals with them, G20 included. 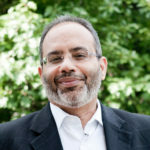 Dr. Carlos Lopes is currently a visiting professor at the University of Cape Town and a visiting fellow at the Oxford Martin School, University of Oxford. Between September 2012 and December 2016 he was Executive Director of the United Nations Economic Commission for Africa.